For people who are quite familiar with music producer Don Jazzy, it is not quite difficult to miss the fact that he has or had deep roots in the popular Nigerian white garment church, Cherubim & Seraphim. And just so you know, Don Jazzy used to be a drummer too at the church many years ago before he traveled to the UK. 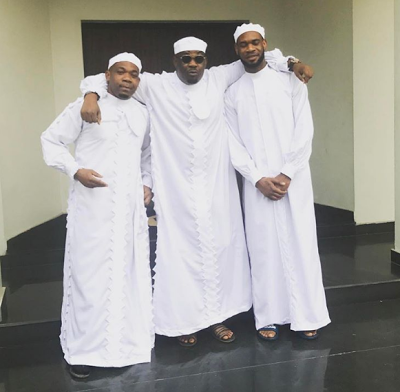 The mavins boss shared this really cute photo of him and his brothers D’Prince and Jay Mavin all dressed in their flowing white garment robes.